Political season is upon us and it seems nearly impossible to escape political discussions. While some people enjoy arguing with those who have opposing viewpoints, others like to speak mostly with like-minded citizens. Where you live can certainly impact the political views of your neighbors. With this in mind SmartAsset wanted to see which cities in America were the best for liberals and which cities were best for conservatives. In order to figure out the best places to be a liberal and best places to be a conservative SmartAsset looked at factors that we thought conservatives and liberals agreed made for a good place to live. For example, cities with a stronger economy and cities with lower costs of living scored well. We factored in education, population growth and upward mobility as well, since those are all indicators of a city with high a standard of living. To differentiate between cities that were simply nice to live and those liberals or conservatives would prefer to live in, we included a political ideology score. To see where we got the data and how we scored each city, read the full data and methodology section below. State Capitals and Liberals. Four of the best places to be a liberal are state capitals, while only one conservative-leaning state capital breaks the top 10 best places to be a conservative. Great Texas Cities. Texas has options for both liberals and conservatives. Three of the top 10 conservative cities are in Texas. Austin is in the top 10 for liberal cities. 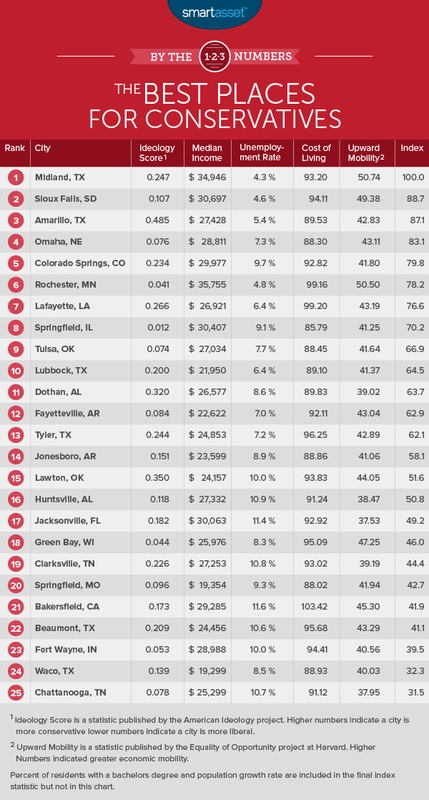 Only Minnesota and Colorado also have cities in both the top 10 for liberals and top 10 for conservatives. Geographic Balance. All ten of the best cities to live for liberals were in 10 different states. In fact, until San Diego appears at 14 every one of the best places to be a liberal was in a different state. Conservative South. Most of the cities which did well for conservatives tended to be in the South. Seattle is the second most liberal city in our study, behind only San Francisco. Seattle offers a lot of great features like the 4th lowest unemployment rate (6.5%), the 2nd highest median income ($40,412) and the most educated population (43.49% of residents have a bachelor’s degree). Seattle has recently implemented a $15.00 minimum wage, the highest in the country and a policy that liberal progressives like Bernie Sanders have been pushing for the entire country. Austin is the highest-scoring liberal city in Texas. While it is not quite as liberal as some other cities in our study, it does have a strong economy (5th lowest unemployment rate) and a very highly educated local population (5th highest percentage of residents with a bachelor’s degree at 33.86%). San Francisco has long been a center of liberal activism. The last time San Francisco County did not vote for a Democratic presidential candidate was in 1954, when it narrowly voted for Dwight D. Eisenhower by a score of 52-48. In the 2012 presidential election San Franciscans voted 83.4% for Obama 13% for Romney (3.6% voted for a third party). Other than being the most liberal city in our study, San Francisco also has the highest median income and 2nd highest rate of bachelor’s degrees among its residents. It needs all those high scores to make up for its high cost of living. San Francisco was the 2nd most expensive city to live in according to our data, behind only New York. Colorado is famous for being one of the first states to legalize marijuana in the U.S. According to the Colorado Pot Guide, Denver takes this liberal view seriously by having the highest concentration of recreational marijuana stores in the state. Other than being one of the more liberal cities SmartAsset studied, Denver also has a strong economy with the 6th lowest unemployment rate (7.8%) and the 10th highest median income ($33,810) among liberal cities. 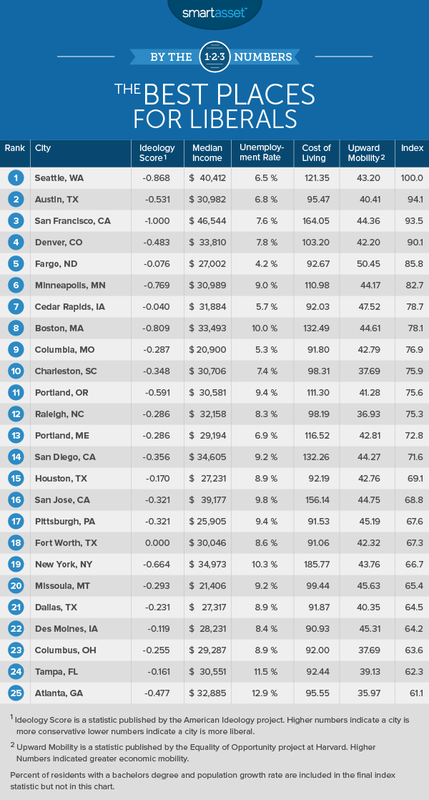 Denver is also the 2nd fastest-growing liberal city in our study. Fargo is the least liberal city in the top 10 but still scores well because it is the fastest growing (2.1% population growth) liberal city we studied and it has the lowest unemployment rate (4.2%). North Dakota has traditionally been a conservative state while Fargo tends to be the most liberal area of the state. In 2008 Obama won Cass County, where Fargo is located, but lost the rest of the state. This meant McCain earned the three North Dakota electoral college votes. Minneapolis is the 5th most liberal city in our study but falls to 6th on our list because of a fairly high cost of living (110.9) and a good but not great economy (16th highest median income and 30th lowest unemployment rate). 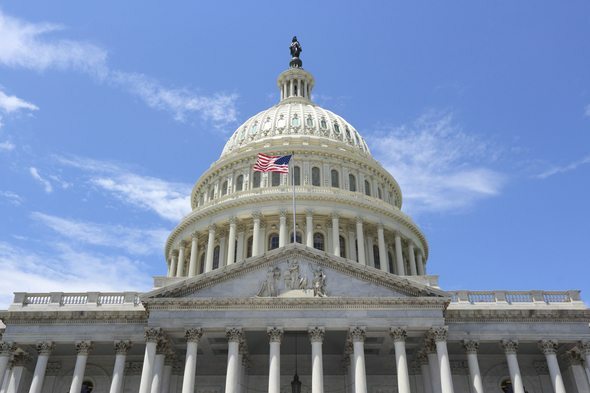 Minnesota has one of the most politically active citizenry in the U.S. with 77% of the population voting in the 2008 election compared to the national average of 61%. 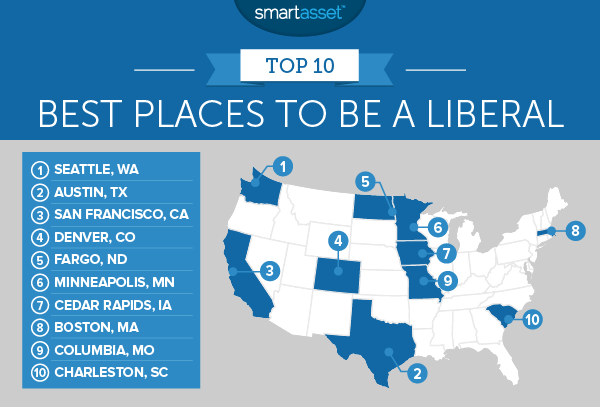 Cedar Rapids, like Fargo, is not the most liberal of places but it does have a strong economy, which is why it cracks the top 10 best places to be a liberal. It also has the 2nd best upward mobility of liberal-leaning cities. By combining one of the lowest costs of living (92.02) with a very low unemployment rate (5.7%), Cedar Rapids is able to beat fellow Iowan city of Des Moines in our rankings. For the politically active parents out there, Cedar Rapids is also the back to back best place for children. The capital of one of the most liberal states in the country, Boston is famous for being the home base of the Kennedy political dynasty. Boston scores in the top 15 in four different categories in our study: political ideology, median income, percentage of residents with a bachelor’s degree and upward mobility. Like the other big cities in our study Boston also has a very high cost of living at 132.4, 5th highest according to our data. The overall economic climate is mixed. As mentioned Boston has one of the highest median incomes but has a middle-of-the-road unemployment rate (10%). Boston has not had a conservative mayor since 1930. Columbia scored above average in every category we researched. In particular Columbia has very good scores in unemployment (5.3%), percentage of residents with a bachelor’s degree (31.5%) and cost of living (91.7). Charleston is a bit of blue in the sea of red that is South Carolina politics. Conservatives usually dominate South Carolina politics. 5 out of the last 7 governors have been conservatives. In contrast, Charleston has not had a Republican mayor since 1877. Charleston had top 10 scores in unemployment rate (7.4%), percentage of residents with a bachelor’s degree (33.5%) and population growth (2.1%). Midland is the number one place to be a conservative in our study. Its history in presidential elections seems to back up that claim. Midland has not voted for a Democrat for president since Harry Truman in 1948. Not only is it the 6th most conservative city in our study but it also scores well in every category except percentage of population with a bachelor’s degree (17.5%). The cost of living is low at 93.19, compared to the national average of 100. Midland is first for conservative cities in population growth, upward mobility and unemployment rate. Like a few of the liberal cities, Sioux Falls earned its spot in the top 10 largely on the basis of its economy and general livability rather than how political it is. Relative to other cities in our study Sioux Falls isn’t the most conservative but it scores well enough in every other category to make up for it. Sioux Falls has top 10 scores in 5 categories: median income ($30,697), unemployment rate (4.6%), rate of residents with a bachelor’s degree (23.68%), upward mobility (49.38) and population growth rate (1.8%). Amarillo is the most conservative city in our study but doesn’t quite edge out Midland and Sioux Falls in terms of economic and demographic performance. This is not to say Amarillo’s economy is bad. Amarillo still has the 12th highest median income ($27,428) and the 4th lowest unemployment rate (5.4%) of the conservative cities we analyzed. In terms of presidential elections, Amarillo has voted Republican every chance it has gotten since 1976. The first and only Nebraskan city to crack the top 10 best places to be a liberal or a conservative, Omaha can offer conservatives a strong economy with a low cost of living. It is interesting to note that the traditionally conservative city of Omaha actually voted for Obama in 2008. This was the first time a Democrat received any Electoral College votes from Nebraska since 1964. Colorado Springs is like the yin to Denver’s yang in terms of Colorado politics. It is the base of conservatism in Colorado and according to our research also one of the cities with the lowest taxes. In terms of conservative cities in our study, Colorado Springs is the 8th most conservative, has the 6th highest median income, 4th most educated populace and has the 7th highest population growth. The only downside may be the relatively high unemployment rate (9.2%). The Mayo Clinic is headquartered in Rochester and employs almost a third of the total population. Thanks in part to that relationship with the Mayo Clinic, Rochester has the highest median yearly income of any conservative-leaning city in our study at $35,755. Rochester also has the most educated population of conservative-leaning cities and the 3rd lowest unemployment rate. Politically, Rochester is relatively centrist which is why it is not higher on this list. Lafayette, or the Hub City as it’s known, is the sole representative of Louisiana in the top 10 best cities to live for conservatives. What makes Lafayette a good city for conservatives? It is the 4th most conservative city we studied as well as being one of the most educated (21.75% of residents have a bachelor’s degree). 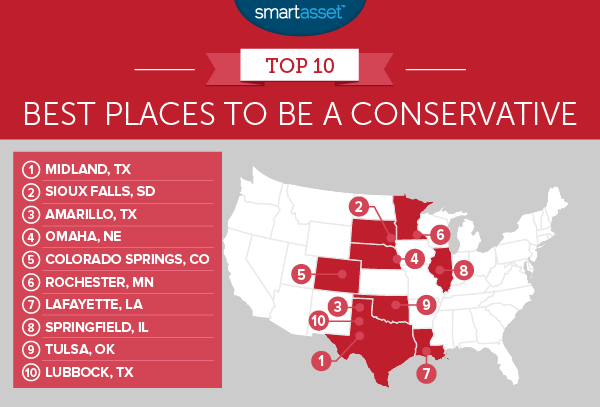 Springfield, Illinois is the only conservative state capital to make the top 10 best places to be a conservative. Springfield has a long political tradition. It is the city where Abraham Lincoln made his start in politics and is where Obama announced he was running for president in 2007. Unfortunately, the population of Springfield is actually shrinking and Springfield has a relatively high unemployment rate of 9.1%. On the bright side the median income is pretty high at $30,407 and the city has one of the lowest costs of living in our study at 85.78. Tulsa is the second largest city in Oklahoma and its current mayor is conservative. In fact, current Oklahoma Republican Senator Jim Inhofe used to be the mayor of Tulsa. Other than the politics in Tulsa, conservatives can get excited about Tulsa’s very low cost of living (88.4) and its relatively low unemployment rate (7.7%). The third and final Texas representative in the best places for conservatives to live, Lubbock is also nicknamed the Hub City. Lubbock beat out the more conservative Dothan, AL by only .08 on our index to grab the 10th spot. The reason why they are ahead of Dothan is the strong local Lubbock economy. Lubbock has an unemployment rate of only 6.4%. Ideology Score – Data is taken from the American Ideology Project. Median Income – Data is taken from the U.S. Census Bureau. Unemployment Rate – Data is taken from the U.S. Census Bureau. Education Rate – This statistic is the percentage of residents who have a bachelor’s degree. Data is taken from the U.S. Census Bureau. Cost of Living – Data comes from the U.S. Census Bureau. Compare a city’s number to a national average of 100. Upward Mobility – Data is taken from the Equality of Opportunity Project. In order to come up with a final index, SmartAsset ranked every city according to these seven statistics and then averaged the rankings for each city giving equal weight to each statistic. The cities were then indexed relative to the highest- and lowest-ranking cities.